Creativity and logic converge in M.C. Escher’s mind-bending art of mathematical perfection. The Dutch Escher (1898-1972) is the world’s most famous graphic artist; his interlocking figures, shapes and mirror images presented in black and white enhance their implausible dimensions. As a student, Escher disliked math as much as he disliked flat shapes, thereby compelling him to create otherworldly optical illusions. Escher’s pop culture references appear in everything from The Simpsons to The Matrix to music and video games. Maurits Cornelius Escher, called "Mauk" by his parents, was born in Leeuwarden, Netherlands on June 17, 1898. His father, George Escher, was a civil engineer; his mother, Sarah, the daughter of a government minister. Though family hopes had been that he would enter a career in architecture, he showed little promise during his formal schooling except in the areas of art and design. He would write later, "At high school in Arnhem, I was extremely poor at arithmetic and algebra because I had, and still have, great difficulty with the abstractions of numbers and letters. When, later, in stereometry [solid geometry], an appeal was made to my imagination, it went a bit better, but in school I never excelled in that subject. But our path through life can take strange turns." Recommended books on Escher: M.C. Escher: His Life and Complete Graphic Work (With a Fully Illustrated Catalogue) by F. H. Bool, J. R. Kist, J. L. Locher, and F. Wierda; M. C. Escher by M. C. Escher and Maurits Cornelis Escher; The Magic Mirror of M.C. Escher [25th Anniversary Edition] by M.C. Escher and Bruno Ernst; M.C. 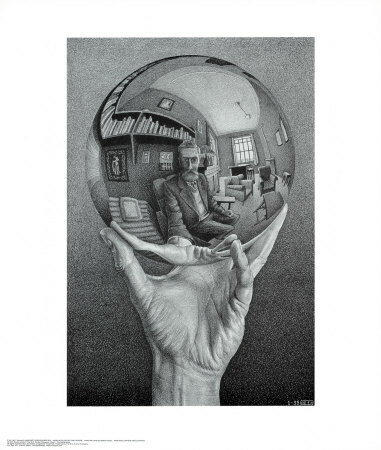 Escher : 29 Master prints by Maurits Cornelis Escher; The Magic of M.C. Escher by J L Locher; M.C. Escher, Book of Boxes: 100 Years 1898-1998 (Taschen Specials) by M. C. Escher; M. C. Escher Kaleidocycles: An Illustrated Book and 17 Fun-to-Assemble Three-Dimensional Models by Maurits Cornelis Escher, Doris Schattschneider, and Wallace Walker. Available here are these M.C. Escher posters and prints, among others: Eye, Relativity, High and Low, Waterfall, Hand with Globe, Three Worlds, Drawing Hands, Bond of Union, Ascending and Descending, Another World, Puddle, Skull with Cigarette, Three Spheres I, Mosaic II, Day and Night, Reptiles, Sky and Water, Still Life and Street, Metamorphosis I. Featured Books: M.C. Escher: 29 Master prints, Harry N. Abrams; M. C. Escher, Taschen; M.C. Escher: Visions of Symmetry (New Edition), Harry N. Abrams; M.C. Escher: His Life and Complete Graphic Work (With a Fully Illustrated Catalogue), Harry N. Abrams; M.C. Escher: Coloring Book, Harry N. Abrams; The Pop-Up Book of M.C. Escher, Pomegranate Communications; M.C.Escher's Legacy: A Centennial Celebration, Springer.